We are nearing the very end of our time in the ‘whale aisle’- it has been a wonderful yet somewhat exhausting time! We made it through a heat-wave summer clad in Tyvek suits and overcame vitamin D deficiencies due to a lack of natural lighting. The whales were affectionately given nicknames and individual specimens adopted by conservators dedicating their time to pampering those in particular, who in turn visited us in our sleep (no, really)! This blog entry provides an update of our ‘Once in a whale’ project. Over the past six months the seven specimens have received our undivided care and attention: Their bones have been cleared of dust and oil secretions; fragile and vulnerable areas have been consolidated; previously degraded repairs conserved; old copper and iron wires removed and replaced with stainless steel; and the skeletons’ anatomy corrected where possible through re-articulation. Since our last project update, the ribcages, mandibles and fins have been re-articulated and re-attached using new bolts and nuts. 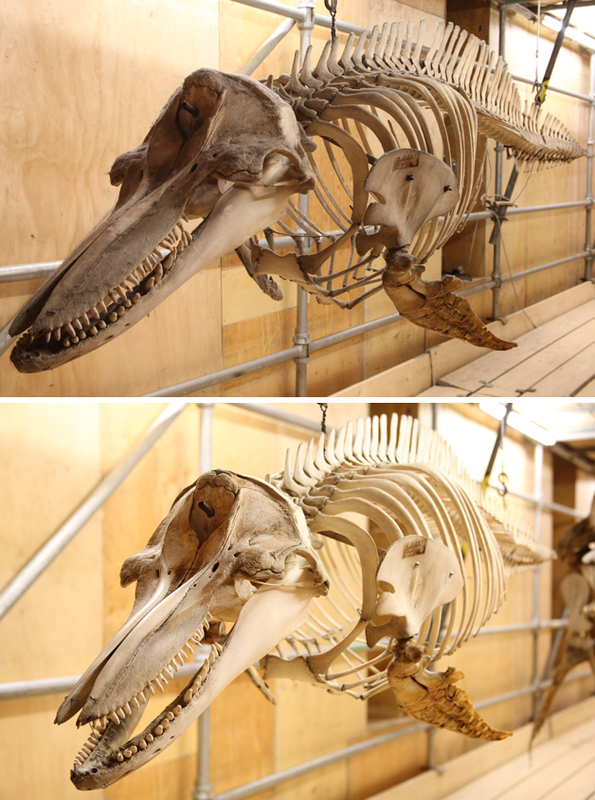 This last stage has been very satisfying, but seeing the skeletons ‘come back together’, has also left us feeling a little lost- we nursed the whales back to health over many months, during which we grew very fond of them, and now we must let them return to the display for all to admire! 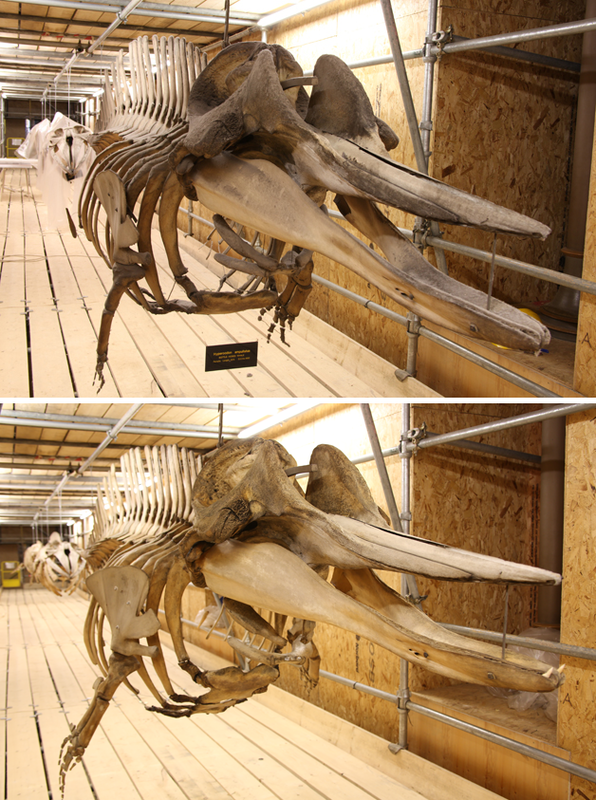 Our blog ‘www.onceinawhale.com’ set out to capture and convey the conservation process including the material science and expected degradation pathways of skeletal material. We shared our treatment rationale and methodology, and showed before, during and after treatment images. We have been overjoyed with the international blog following we have received and are thankful to all readers who commented on, shared or ‘liked’ our posts! As my contract at the museum now nears its end, I hand over the blog strings to my colleagues, who will continue to share the project with you! 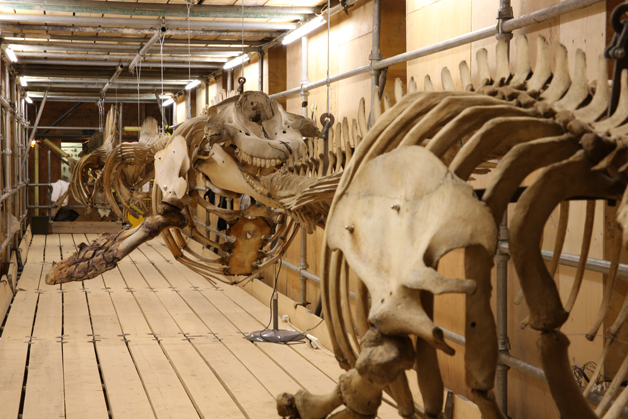 Creative professionals and enthusiasts have been inspired to join us in the ‘whale aisle’ to illustrate, film and photograph work being carried out on the cetacean specimens. Journalists and broadcasters at Oxford Mail News and BBC Radio Oxford featured articles and interviews and our social media presence has been amazing to see. 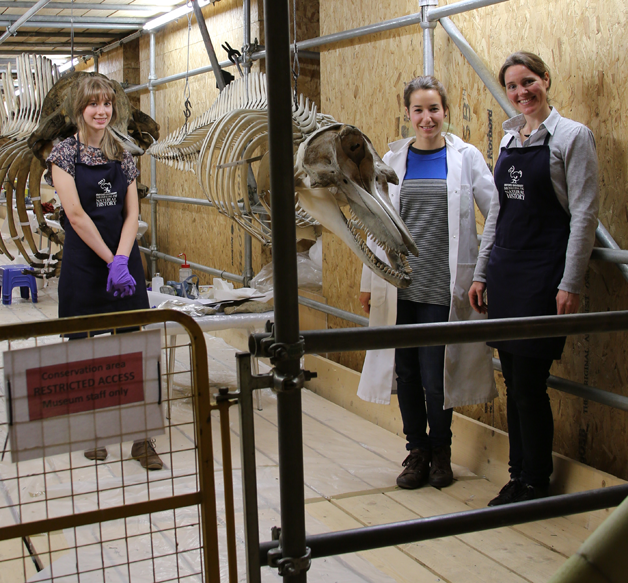 We have also loved sharing the opportunity to see the skeletons up close and learn about the conservation involved with fellow and further afield museum colleagues, conference attendees, fellow conservators and local school pupils. During the imminent process of dismantling the scaffolding, the five skeletons will be re-positioned and elevated back into the museum space above visitor’s heads, forming a dynamic display allowing visitors to appreciate the specimens from below as well as from the upper gallery. Do come visit the whales after our reopening in February 2014! – Thanks again to all our blog followers, more to follow soon! Thank you so much! As a paper conservator, I found your work fascinating!